The Eastern Mole or Common Mole (Scalopus aquaticus) is a medium-sized North American mole. It is the only member of genus Scalopus. It is found in forested and open areas with moist sandy soils in northern Mexico, the eastern United States and the southwestern corner of Ontario in Canada. This animal has grey-brown fur with silver grey underparts, a pointed nose and a short tail. It is about 16 cm in length including a 3 cm long tail and weighs about 75 g. Its front paws are broad and spade-shaped, specialized for digging. It has 36 teeth. Its eyes are covered by fur and its ears are not visible. 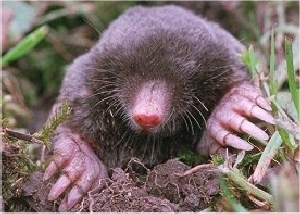 This mole spends most of its time underground, foraging in shallow burrows for earthworms, grubs, beetles, insect larvae and some plant matter. It is active year round. This animal is mainly solitary except during mating in early spring. The female has a litter of 2 to 5 young in a deep underground burrow. Myth 1: I have moles in my yards so that means I have grubs, right? False. Moles eat lots of stuff and grubs are not the only entrée on their menu. It is not appropriate, or for that matter legal, to apply a grub control insecticide to eliminate moles. First of all it won’t work, second of all the pesticide label is the law and insecticides are not labeled for mole control. Myth 2: Juicy Fruit, Bubblicious, or Extra Spearmint gum control moles. I usually tell people if it works for you that’s great, however I have no evidence to support this recommendation. I suppose if nothing else you’d have moles with good breath. Myth 3: Mole repellants, underground sonic waves, pinwheels in the yard will get rid of my moles. False. Pinwheels are decorative though. The only time tested effective method for controlling moles is trapping. A vole (Meadow Mice) is a small rodent resembling a mouse but with a stouter body, a shorter hairy tail, a slightly rounder head, and smaller ears and eyes. There are approximately 70 species of voles; they are sometimes known as meadow mice or field mice in America. The voles, together with the lemmings and the muskrats, form the subfamily Arvicolinae. 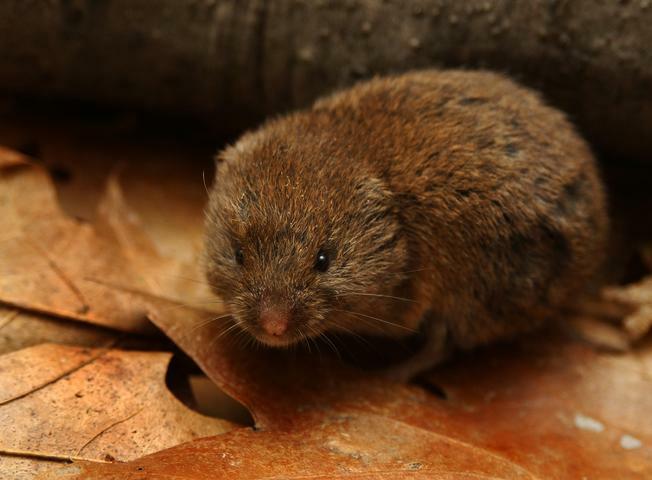 This one is a small vole found in eastern North America. It is also known as the Pine Vole. These animals have short, soft reddish-brown fur on the upperparts and greyish brown underparts. They have short ears and a short tail, somewhat darker on top. They are 12 cm long with a 2 cm tail and weigh about 29 g.
They are found in deciduous woods with leaf litter and soft soils in the eastern United States to central Texas and as far north as southern Ontario and Quebec. These animals make shallow underground burrows, also sometimes using burrows built by other small mammals. They are often found in small loose colonies. Voles are poor climbers and do not usually enter homes or other buildings. Instead, they inhabit wild lands or croplands adjacent to buildings, or gardens and landscaped sites with protective ground cover. Most problems around homes and gardens occur during times of large meadow mouse populations.